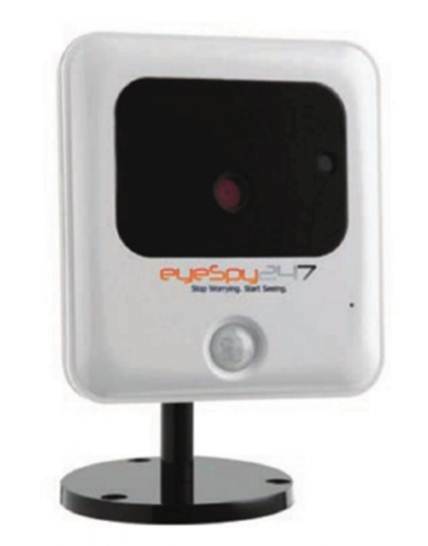 EyeSpy247 sells IP cameras and offers a cloud-based home and office video-monitoring system to use with them. This online service removes some of the hassle from setting up a surveillance system, as it can be used to remotely check a camera's feed, send automated email and SMS alerts and store a limited number of images and video. The EXT+ can be used independently or in conjunction with this online portal. It's designed to function indoors or outdoors, and has a more rugged design than many IP cameras, made from a strong polycarbonate material. The supplied power and ethernet cables have a tough rubber connector that completely covers the port, leaving no electrical parts exposed. It comes with a mounting stand, too. The bundled software is basic, with a video viewer and a simple tool to set up the camera. This tool works only in Windows; the Mac version directs you to the camera's admin page for registration and setup. As with the EyeSpy247 HDSD (tinyurl.com/5wuy7q2), we ran into problems with the automatic registration process. We had to manually forward two ports on our router, then copy our user details on to the website. We could then view its feed, and it began sending us emails with a screen capture attached whenever it detected motion in the room. You can create three presets for recording quality and adjust them as required. Bitrates range from 512kbps to 10Mbps, at up to 30fps, with a choice of H.264 or MJPEG encoding and Flash or QuickTime formats. The EXT+ can record in 720p video, with three lower resolutions also available. At its highest setting video quality is clear, although audio quality is muffled - especially from a distance. Subtle infrared lights permit night-time recording, with short-range objects clearly visible, even in pitch black. A non-removable 32GB SD card is fitted, and there's support for uploading a stream to an FTP server or a Samba device on the network. Recordings are then triggered manually, via audio or motion detection, or at certain times of day. EyeSpy247 gives 512MB of online storage space for $37/year (first year free) and 20MB free thereafter. When used in conjunction with the online portal, the EXT+ works smoothly. A robust build should protect the internal electronics from the elements.